Lately, I have let the spirit move me. Getting past ambitious ideas that were keeping me back. Also past old habits of deference with people in my life. The silly notions fell away, and something important has started to happen. For one thing, I started a sweater on July 2nd. 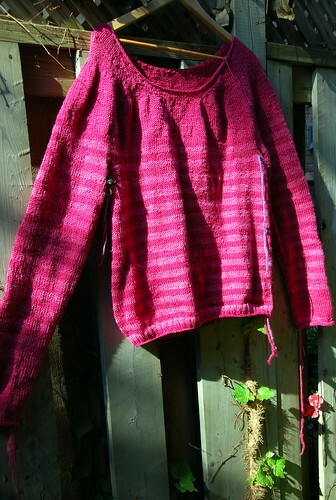 A short and largely disappointing summer turned out of its skeins and into a garment that I will be proud to wear. The yarn was upstairs since it came out of successive cochineal dye baths last August 25th. The 25g of cochineal that taught me what its “medium shades of the colour range” might be. Pink – each exhaust tinted. This year 2 competing ideas rented space in my brain: (a) overdye it now; (b) monochrome acrobatics on the needles. 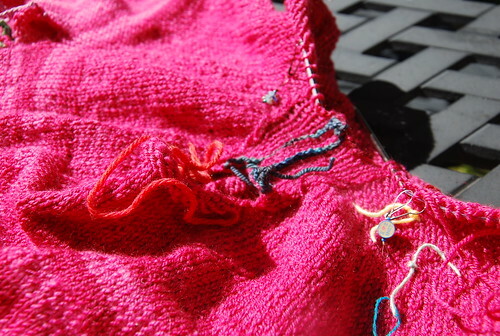 I am not entirely clear on what brought me back to handspun sweater knitting on July 2nd. Sure, I was laid up, and it’s been a cool summer but what exactly led me to Sarah Swett‘s “Everyday Striped Cormo Shirt” design? Self-care is part of it, surely. As is a need to draw on the sparks that created what I wrote down as 1,528.84 yds with two red ink lines underneath. Fine yarn and a loose gauge give it drape; seamless construction makes it easy to put on and take off; a close but by no means tight, fit means it is so comfortable I can hardly tell it is on. And the stripes? They’re just fun. My haggard (I remember July 2nd well) brain probably just remembered Sarah’s spring workshop. I learned there how powerful simple ideas carried to execution really can be. Sarah wore and spoke about her striped shirt as she taught the class. Something brought this all together. Plus, the one size given as 36″ bust would fit. My yarn gave a close enough gauge, and I would juggle the light pink like nobody’s business, right? Right. The stripes were fun. I learned Meg Swansen’s jogless jog. 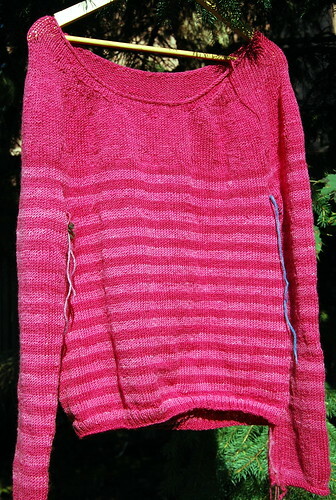 My version is knit with U.S. size 6 needles. Looking closely you can trace my improving attitude toward the end. See the short cast-on at the lower edge? I was in no mood to pull it out & start over. Increases happened later. Immediately after which we have the Yardage Be Damned phase, i.e. a K2, P1 ribbing, and also that extra inch in the body. 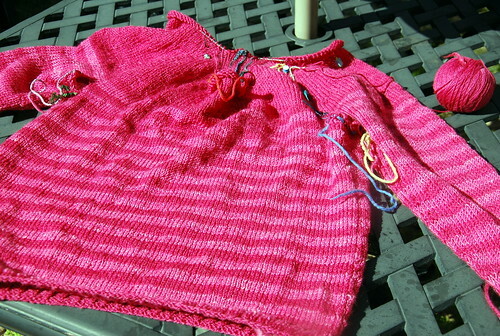 It really is the same knitter who then goes off-pattern and drops her 1st steeked neck. I used Meg Swansen & Amy Detjen’s crochet method in “Knitting with Two Colors“ to secure the 3 steek stitches. 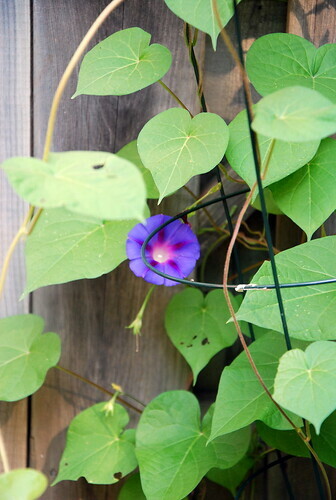 It was a very deep breath before I cut. Instead of casting 20 stitches off for the neck, I held them on scrap yarn. On the next round I cast 6 stitches on by the backwards loop method. 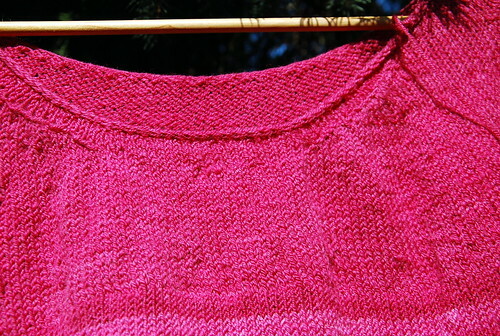 This was what Elizabeth Zimmerman called a “kangaroo pouch neck.” My motivation was simply that I wanted to continue knitting in the round, and Maggie Righetti has very hard words for casting-off neck stitches in any event: “Sweater Design in Plain English“. Apart from ends being woven in, armholes joined and blocking, I finished a sweater in exactly a month at an unusual time of year. Sarah Swett has given the spinning community the fruits of her working a simple idea to perfection. I loved every stitch. 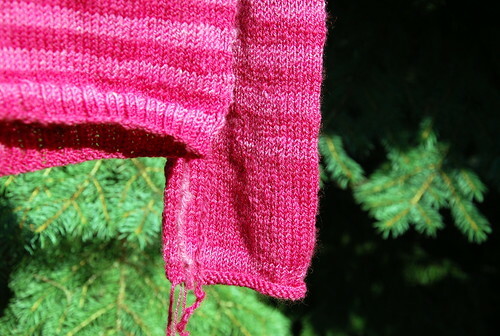 Such an elegant solution for my surprisingly pink yarns. This beautiful Border Leicester x Corriedale pin-drafted roving is a gift from a friend. It’s 15 oz beautifully processed by Morro Fleece Works, and yesterday I broke into it for real. A very satisfying 161 yds turned out by the Spinolution Mach 2. As I will maintain to anyone who asks, the Mach 2 is a fine wheel for what it does. 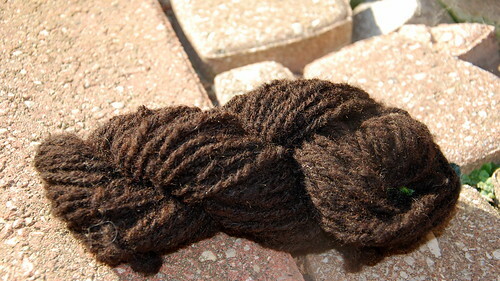 This yarn a dye-pot candidate – black walnut, I think. Yes, willful. 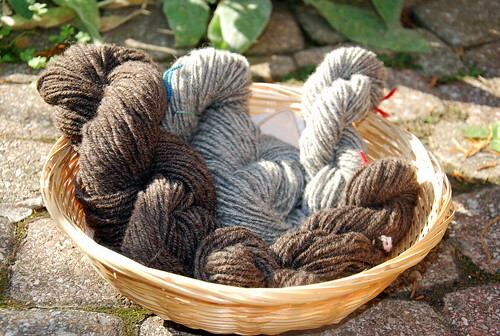 The Hebridean rolags got together & decided they would be opposing-ply when they grew up. Either that or the Watson Martha has a mind of her own. The 54 yds is 2 plies spun right; 1 spun left, and plied left. 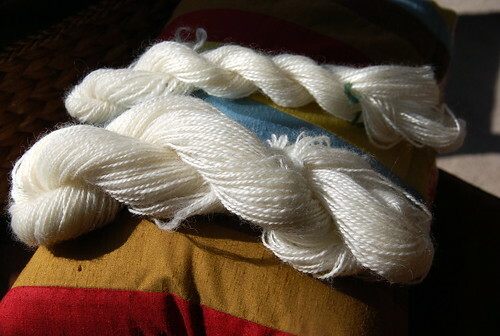 All singles were spun supported long-draw, so we have my first woolen opposing ply, apparently! 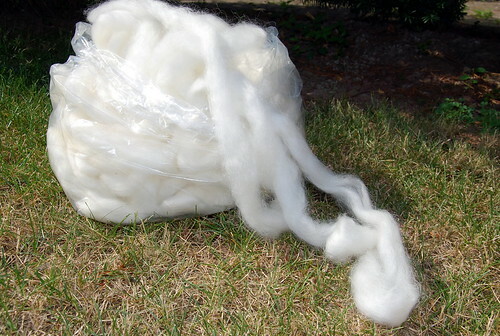 The BFL x Shetland roving for these 3-ply yarns all came from Hopeful Shetlands. It’s further proof that Beth really did teach me how to spin long-draw last spring! 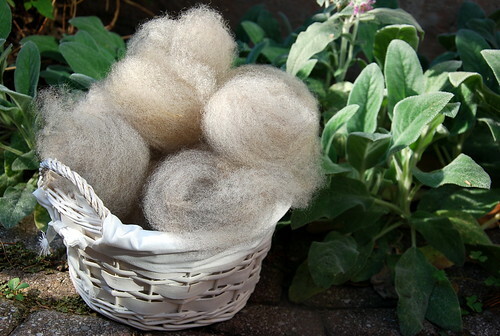 All singles were spun on my Watson Martha – brown in February & grey in August – and plied on a lower ratio. The 305 yds may not be enough for a Rasta tam that I promised to make but it would be lovely. It was fascinating to knit up the small linen skeins. They are from tow flax spun on Wee Peggy for Harriet Boon’s class at this June’s Ontario Handspinning Seminar. The more I ripped back the better the yarn was to knit with! 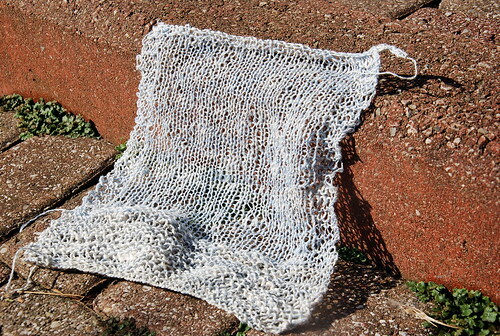 Such a rustic piece of cloth but I really enjoyed knitting on it. Slowly but surely. That’s all I can say about all of these things. Slowly but surely. Categories: Fiber Preparation, Finished & in the wide world, Getting the knack, Natural Dyes, Spinning, Stash in; Stash out | Tags: cochineal, Finn wool, handspun yarn, Hebridean wool, Linen, Romney wool, Spinning, Spinolution Mach 2, sweater, Watson Martha | Permalink.